The horizon looks gloomy for the U.S. job market. Hiring in August is expected to have taken a huge hit, as the number of new jobs created is predicted to be only 121,000. It’s notably higher than a month ago, when the employment report showed that businesses had added a whopping 163,000 jobs. No major change is expected in the other sections of the employment report. Average hourly earnings is anticipated to rise slightly to 0.2% from July’s 0.1% while the rate of joblessness is slated to remain at 8.3%. From his statement, Bernanke made it pretty clear that the central bank bases a big part of their decision on the health of the job market. If the NFP report matches or disappoints expectations, it could tip the scales in favor of more easing. This could be seen as dollar bearish as quantitative easing could lead to hyperinflation and dilute the value of the dollar. As a result, the U.S. Dollar Index, which is the main measure used to gauge the strength of the Greenback against other major currencies, could break below its major support at 81.60. On the other hand, a better-than-expected NFP reading could encourage assumptions that the Fed wouldn’t pull the QE3 trigger yetin its next meeting. This could boost the Greenback enough to push USDX above its 81.60 support. Either way, make sure that you watch the 81.60 closely as it seems to be the market’s line in the sand. What do you think? Will the U.S. employment report serve as a catalyst for the Fed action or will the central bank hold out for a few more disappointing reports before it triggers another round of quantitative easing? 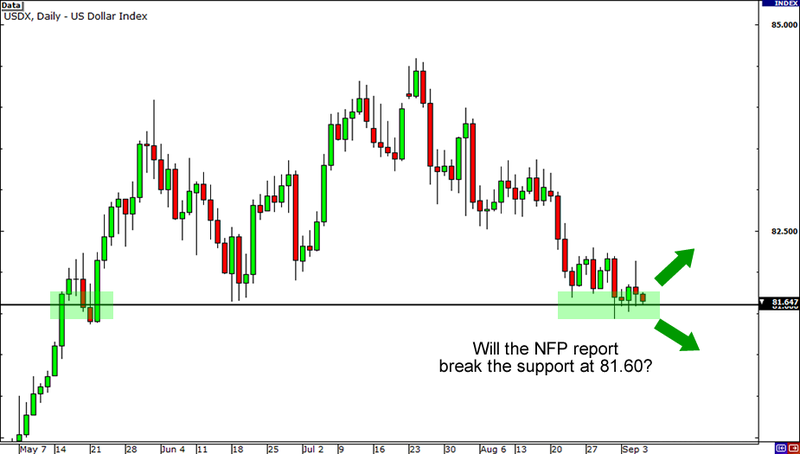 Will the NFP report serve as a catalyst for a QE3 from the Fed?